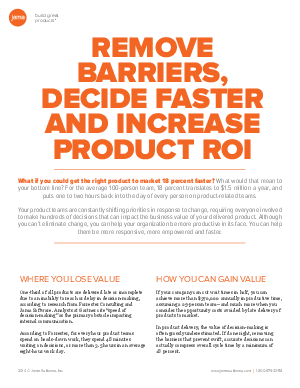 What if you could get the right product to market 18 percent faster? What would that mean to your bottom line? For the average 100-person team, 18 percent translates to $1.5 million a year, and puts one to two hours back into the day of every person on product-related teams. Your product teams are constantly shifting priorities in response to change, requiring everyone involved to make hundreds of decisions that can impact the business value of your delivered product. Although you can’t eliminate change, you can help your organization be more productive in its face. You can help them be more responsive, more empowered and faster.